July August Productions’ supermarket sitcom Checkout! 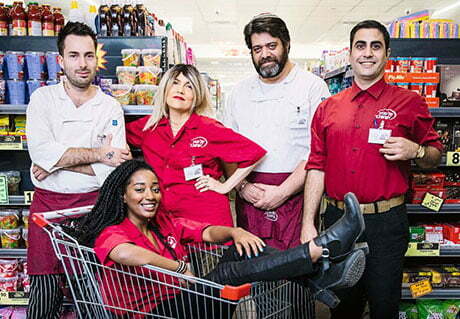 Israeli pubcaster Kan has recommissioned local prodco July August Productions to produce a second season of sitcom Checkout!. Checkout! (known locally as Cash Register) follows the clash of cultures and characters in a dysfunctional Israeli supermarket. Each episode focuses on the stories of the store’s crazy staff and eccentric customers. Kan has ordered a 20×30’ second run from Red Arrow Studios-owned July August Productions, with distributor Red Arrow Studios International handling finished tape and scripted format sales worldwide. In related news, Red Arrow Studios International has secured a number of European deals for its TV movie titles. Spanish broadcaster RTVE has taken a two-year first-look output deal for TV movies and feature films from the Gravitas Ventures titles distributed by Red Arrow. Elsewhere, French broadcaster M6 has renewed its TV volume deal with Red Arrow, while new package deals have been concluded with Spain’s Antena3, Italy’s Mediaset, RTL and RTBF in Belgium, Switzerland’s RTS and RSI and NBCUniversal International Networks’ Movies24 in the UK.